"A yummy, very quick and easy vegetarian dish. On the table in 30 minutes." Bring a large pot of lightly salted water to a boil. Add pasta and cook for 8 to 10 minutes, or until al dente; drain. Heat olive oil a medium saucepan over medium heat, and cook shallots and garlic until transparent. Stir in mushrooms, and cook until tender. 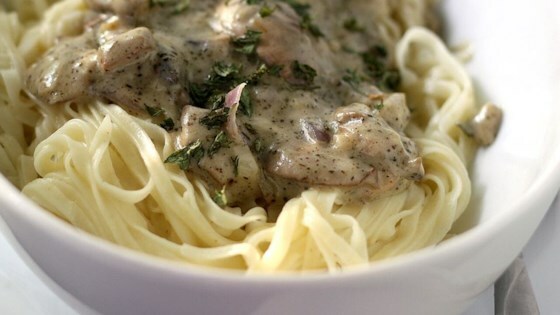 Mix in heavy cream and sage. Cook and stir until thickened. Toss sauce with cooked fettucine, and season with salt and pepper to serve. Watch how to make this flavorful, spicy dish. You can use fat free half and half for less fat and calories...it's still very delicious! A perfectly servicable recipe, but a little lacking in flavor and interest. I'd be tempted to add some white wine to the sauce if I made it again.